The year is ending in another two weeks’ time. 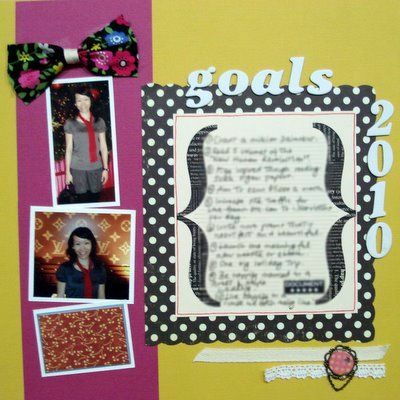 This scrapbooking idea is for you to come up with fresh goals for next year. I used to not set goals for many years. Then when I experienced for myself how my small new year resolution turned into reality, I began to seriously set some resolutions. They kept me focused, on track, and with a sense of purpose. 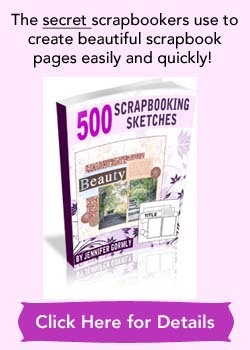 If it wasn’t for my 2009 resolutions, I would have gone into hibernating mode since November! But this year, I’m going to set some goals at the end of the year instead of resolutions at the beginning of January. What’s the difference you ask? Beats me but I want to set goals. :-) So for next year, I’m setting 10 new goals. Lesser than my current 12 resolutions but these are bigger goals that’ll take persistence, discipline, focus and work. Before starting this layout, I felt a little surprised that 2009 is ending soon and I felt something amiss. But now that I’ve completed this layout, I’m beginning to feel excited about receiving 2010! What about you? Have you sat down and come up with some goals you’ll like to achieve for next year? Is it to start the photography business you’ve been thinking for years? To bring your family for a wonderful vacation to San Francisco, your absolute favorite city in the world? Or to start yourself on a weekly exercise program? So go on, sit down for some minutes to set some new goals for next year. Before you can arrive anywhere, firstly you have to know the destination you’re heading to. Of course, along the way, there’ll be some hiccups and stuff that throw you off course, but with this layout, it’ll be reminder to get back on track. 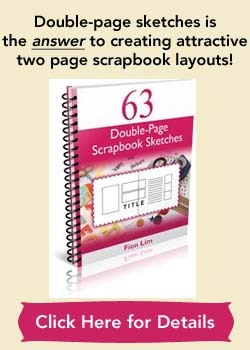 Enjoy this scrapbooking idea! Supplies used: Cardstocks -American Crafts and Bazzill Basics; Patterned papers – Making Memories “Mistletoe”, Graphic 45 “Domestic Goddess Collection – Happy Homemaker and Yours Truly”; Journal paper – Teresa Collins “Journal-It”; White letter stickers – American Crafts “Thickers – Chipboards”; Twill ribbon – from stash; Lace Ribbon – Daiso Japan; Scalloped-edge scissors – Daiso Japan; Pink brass circle charm – from stash; Rectangle chipboard – Brenda Pinnick “Chipboard Die-Cuts”; Fabric floral ribbon – from stash; Red pen – Zig Memory System “Fine & Chisel”; Black pen – Zig Memory System “Millennium”.